This is my first time making egg ribbon soup and I'm blown away by it!!! The fact that six ingredients can make such a flavorful soup in less than 15 minutes amazes me! From what I understand, egg ribbon soup is typically flavored with Asian inspired ingredients, which I'm sure is good! I just thought this one from Robyn Fuoco, the chef at Mainly Cafe and Bakery in Philadelphia, would be a good one to try for my first time because it's different. 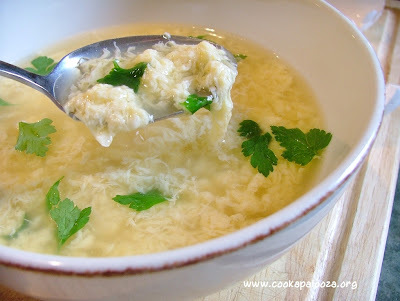 Instead of flavoring the soup with ginger and sesame oil it uses Italian inspired ingredients such as Parmesan cheese, orzo pasta and parsley! There is however one trick you need to know...how to make the egg ribbons. My first shot at it didn't go so well. The second time was a charm. It's not hard. I just screwed it up because I tried to "wing it" without really knowing what I was doing. I put together a short video so you won't have that problem. How to Make the Egg Ribbons for this Soup! This is my 1 minute video on how to make the egg ribbons. If you already know how to make them ...skip it. As for garnishing this soup, instead of chopping the parsley, I find it easier to pluck the leaves (if they’re small) from the stem and sprinkle them directly in my bowl! Egg ribbons, pasta and Parmesan cheese in a delicious easy-to-make soup. In a large measuring cup (or bowl that's easy to pour) whisk together eggs and Parmesan cheese. Set aside. In a large pot, heat water and broth over high heat until it comes to a boil. Reduce heat to medium and add orzo. Cook until orzo is tender, about 6 minutes. Turn off heat. Using a fork, stir broth in one direction. While stirring, gradually add egg mixture until egg ribbons form. 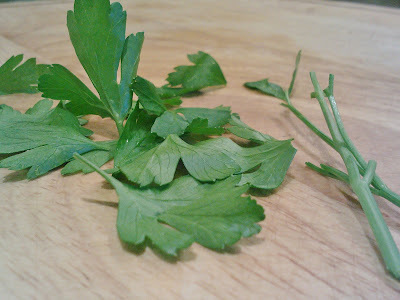 Ladle hot soup into bowls and sprinkle with parsley leaves. More Soup Recipes to Try!